If you don’t want to worry about loose stones going missing, you might want to understand a little bit more of what keeps them in place. Stones are set many ways, but the most common setting style is prong set. Prongs are the little metal claws that secure the stone in the mounting. 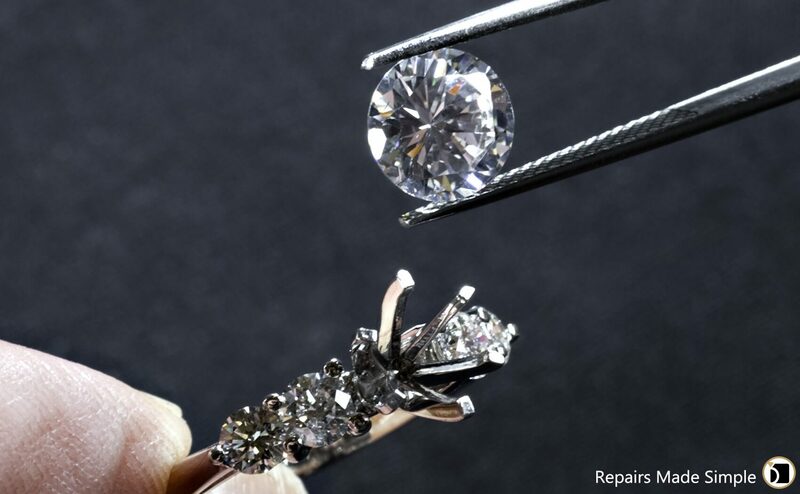 The tips of the prongs can wear down over time, or be lifted off the stone. The prong can be accidentally bent or pulled away from the stone as well. Whether the prongs are compromised by normal wear and tear or accidental damage, they will require routine care and maintenance to avoid the loss of a stone. How do I know if my prongs need repair? •	Inspect the prongs one by one to determine if there is wear and tear. •	Inspect the prongs from the top and from the side to determine if any of the prongs are bent. •	Inspect the tips on your prongs; are they flattened, thin, cracked or pulled away from the stone? •	Inspect your ring for loose stones. Touch each stone with a pin or a toothpick, do they move in the setting? Prong repair can be a simple re-tipping of a worn prong (which is considered routine care and maintenance), or complete rebuilding or replacing of a damaged prong. In a case of severe damage, the entire head of the ring may need to be replaced. Many of the newer ring designs have numerous stones surrounding the center stone or down the sides or shoulders of the mounting. The halo style which has a center stone surrounded by smaller stones in a concentric circle has been very popular in recent years. These more intricate designs should be inspected frequently, and require routine care and maintenance to help prevent or minimize the chance of lost stones. Remember, not all jewelry requires repair, but all jewelry requires routine care and maintenance. For more information about our other types of ring repair services, please visit: Ring Repair Services. If you would like to place a prong repair order, please click on the "Get Started" button below.